Releasing debut albums by new artists is always a great joy, and this time is no exception. 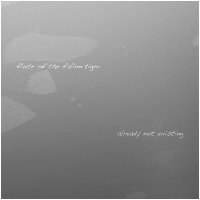 Earth Mantra is very happy to announce the release of Already Not Existing by experimental ambient duo Flute of the Fallen Tiger. This release is a collaboration between two names that should be familiar to listeners of Earth Mantra, David Herpich of Emerald Adrift and Darrell Burgan of Palancar. Together, they create music that is difficult to categorize but falls somewhere in the realms of experimental music, abstract ambient, and dark ambient, with overtones from a variety of genres including film music, jazz and new age. Their debut album, Already Not Existing, was created using an interesting approach. Darrell is known for performing a large number of live ambient improvisations, which he calls "Ambient Train Wrecks". Sometime in 2008, he performed one of these train wrecks on StillStream.com, a performance that particularly resonated with David, who wanted to take the piece in a new direction. During 2008 and 2009, David completely reworked the performance into its current form, combining sections of it with new compositions by David, with Darrell doing the final mastering of the recording. And thus, Flute of the Fallen Tiger was born. Already Not Existing is a great example of how diverse styles can blend to form something unique. The music is mostly (but not completely) abstract and covers a wide variety of ground. Sometimes it is completely atonal and without tempo, floating along in its own context. At other times, the music thoroughly embraces tonality, although usually in an orthogonal way. The result is a melange of forms, which evolve over time from something abstract and textural, to something bright and angular, and then to something dark and ominous, with everything in between. A journey in its own right. We are happy to be bringing the music of Flute of the Fallen Tiger to our listeners, and we hope that this is merely the first of many collaborations between these two artists in the future.